← It’s time for Preschool: Have you considered a Nature Based Preschool? When we came in on Tuesday to the Pilcher Park Nature Center we were greated by a suprising visitor! 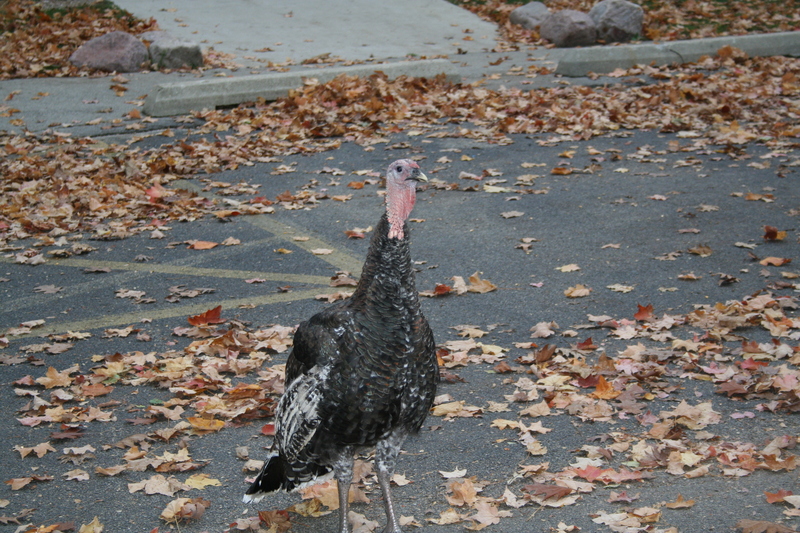 A month before Thanksgiving a WILD Turkey came to visit us all on his own! This guy was fairly tame/imprinted. He came right up to us and ate corn nearly from Super Dave’s hand. As the children arrived for Little Sprouts Nature Based Early Learning Center they were amazed to see our new friend. He stuck around at least long enough for some pictues ( it was picture day after all) and then because he was a bit too friendly, was sent to a farm in the area. He is NOT locked in a pen and may leave if he chooses any time. At the time of this writing he has not chosen to leave but he is safe there and will not become someone’s Thanksgiving dinner! This entry was posted in Uncategorized and tagged children, children and nature, Children and Youth, Holidays, Illinois, Joliet, kids n nature, nature, nature play, outdoors, outside, Pilcher Park, Pilcher Park Nature Center, preschoolers, Thanksgiving, Thanksgiving dinner, things to do with kids, Turkey, Wild Turkey. Bookmark the permalink. 2 Responses to Wild Turkey Natural Choice for Thanksgiving? Our Little Sprouts Think So! Thanks for visiting my blog today. I love to see wild turkeys. Great blog post!